Only one of the guests was hearing impaired. He functions as a hearing guy, because he was a hearing guy for most of his life. After his surgery a few years ago, he’s now got a hearing loss and a hearing aid. I knew that. He knows I know (more than) a bit about deafness and hearing loss, including and especially how to include everyone in a group whether for a discussion or viewing media like this event. I appreciate the value of captions for all sorts of reasons. The obvious circumstance is that it allows a hearing impaired person to understand what’s said on television. But of course, the rest of us find the captions handy when we’re temporarily hearing impaired, as in a noisy bar or restaurant. I remember a time before we could get captions, and the struggle to improve the ratio of captioned to non-captioned television shows and commercials, when access using captions was still voluntary. At our place, we’ve got the now-standard big screen digital TV with cable service that supplies us more channels than anyone needs to look at most hours of most days. It lives in the great room, which has areas that function as the kitchen, dining table, living room, and office. I know there’s a way to make one remote do all the work, but I haven’t figured out how to implement that, so we still live with 3 remote controls (TV, Blu-Ray player, and DVR-cable). Our typical thing is to turn on the TV using its remote, the cable box using its remote, then adjust the volume with the TV remote and the channels with the cable remote. Pretty silly, no? 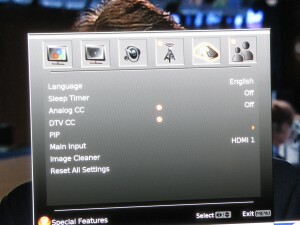 To watch a movie on disc (instead of through the cable), we have to press control buttons on the TV remote to switch to HDMI-2 from HDMI-1. Occasionally we find a disc for which the volume is set too low even for ordinary aging ears, and that becomes an issue. No running the water or starting the dishwasher during those times. What neither my friend nor I anticipated was that the captioning wouldn’t work. Or that we couldn’t figure it out. At first we thought the evening would be fine without the captions, but with over 15 people in the room, any side comments drowned out the TV audio for him. By the time we realized we needed to do something about captions, the program was upon us. 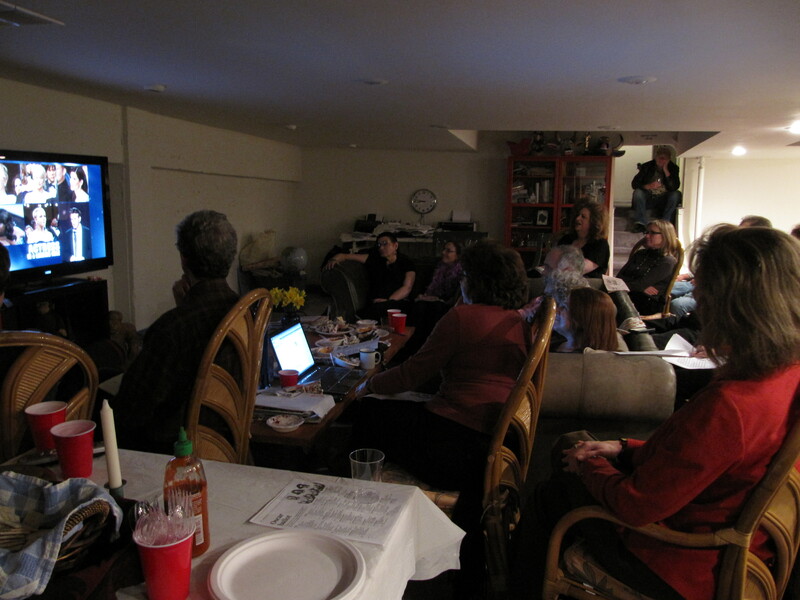 But we weren’t going to do anything drastic that might prevent the rest of the group from viewing the program. 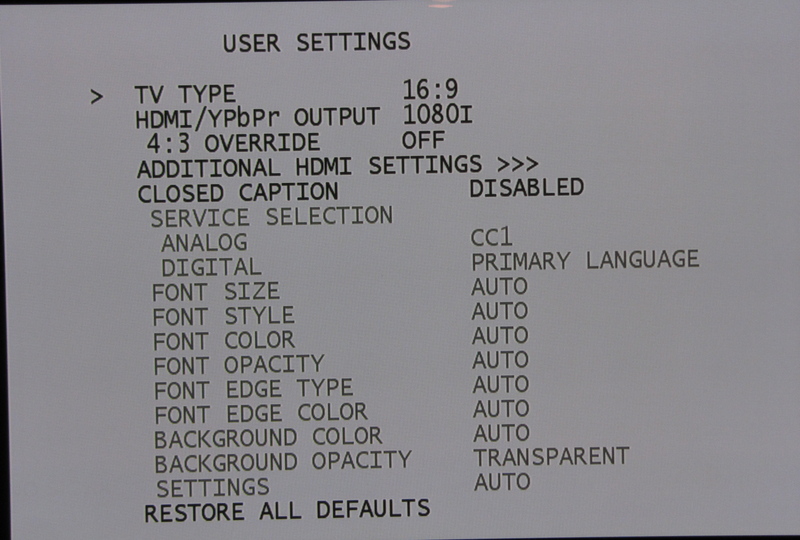 We played with the TV remote and found the on-screen indicators for Analog CC and DTV CC (which we assumed mean “closed captions”), but they were locked (indicated by the red circle with a diagonal slash through it, as in the image below). 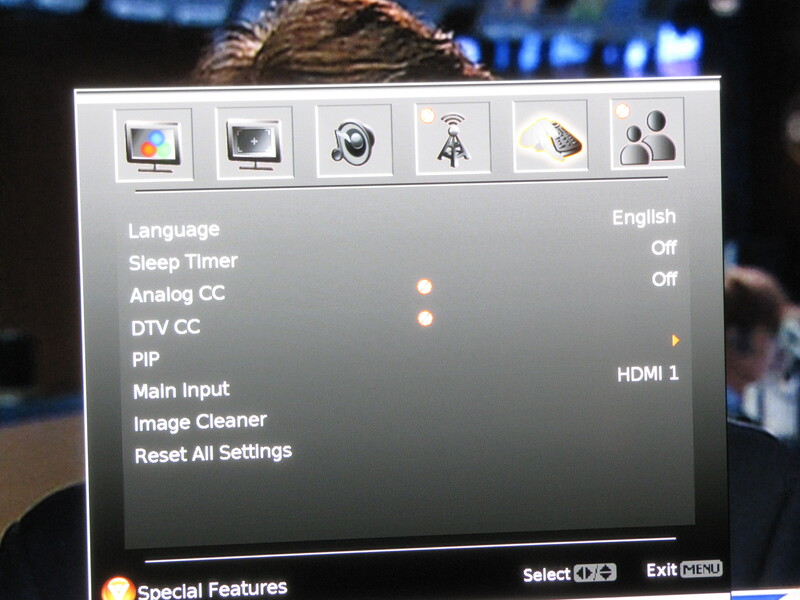 Trying to select either of those lines (Analog CC or DTV CC) with the up-down arrows on the TV remote just caused frustration, because the selection line jumped between Sleep Timer (above) and PIP (below). We played with the cable remote and couldn’t find anything that would select controls for CC. Just this morning (Wednesday following Sunday’s broadcast) I finally went to the ‘net and entered a search string that included the brand name of the TV and the words “closed captions.” And what did I find out? A helpful site with user-contributed content seems to have the answers. Ah! I need to turn OFF the cable box (aka “set top box” STB), use the menu that’s available only when the STB is off (counter-intuitive, no? 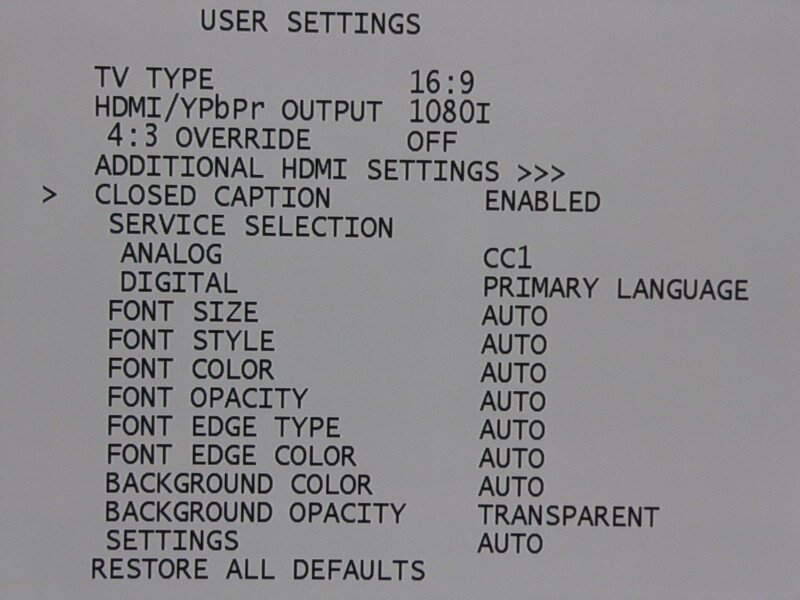 ), and select captions from there, because we’re using the HDMI setting rather than directly viewing via the TV or component settings. 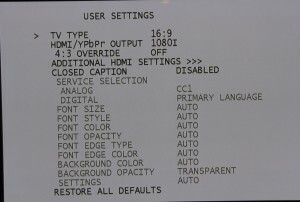 Then turn on the STB again and captions should appear. 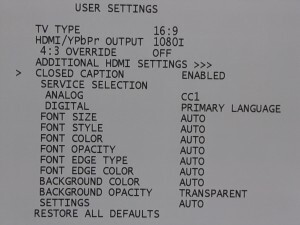 The images left and right show the screen when the STB is off and MENU is selcted, left one with captions off, the right one with captions selected. There are so many attributes for captions that I hadn’t known about! Font size, color, style, opacity. Change the types of edges or color of the background. I like the idea of background “transparency,” which makes the captions show up, while not blocking the scene behind them. I’ll need to try using that setting for a real show to find out if it works as well in practice as in my rich imagination. Fishbird is powered by	WordPress 3.6 and delivered to you in 0.188 seconds using 37 queries.